View More In Tool Trays. This organizer makes sorting and storing your sockets easy and convenient. Two rows of sizing bolts with easy to read labels - metric and SAE - help to quickly identify the size of sockets. The socket sorting feature does not use the outside diameter of sockets which usually works only for specific brands. This organizer actually measures the inside size of sockets, so all makes and brands can get sized. And this is how it works: - Place socket on sorting bolt - Does not fit? Try next smaller bolt - Loose fit? Try next bigger bolt - Slides on with tight fit? Done! Label next to the bolt shows the size Typically sockets are stored upright and sit on clips or bolts in the driving hole. Different holders are needed for 1/4", 3/8" and 1/2" drive sockets and a deep drawer is needed for storing long sockets. The organizer can sort and store any drive size as well as short and long socket. Or any other tool you may want to keep with your sockets and that fits in a storage compartment. Since sockets are stored on their side in the tray, the organizer keeps a low profile and fits in shallow drawers. Special storing space is provided next to sizing bolts for frequently used short sockets. 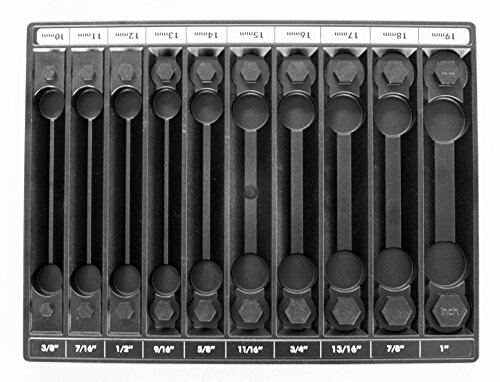 The organizer measures only W 14.5" x L 11" x H 1" but can hold more than 50 short sockets (W 14.625" if a small plastic strip to hold packaging card is not removed). Please note that sockets are NOT held in place in this organizer. The tray is portable to get your tools to wherever you need them, but sockets will fall out if you turn the organizer upside down. The sorting studs are designed to measure sockets. They are not long enough to store sockets on them - they will fall over if you try. Check out reviews by The Humble Mechanic and The Protool Review to see and hear what experts think! Check out www.skyleapllc.com for information on more products. Accommodates sockets from 10 mm to 19 mm and from 3/8" to 1"
If you have any questions about this product by Tool Sorter, contact us by completing and submitting the form below. If you are looking for a specif part number, please include it with your message.